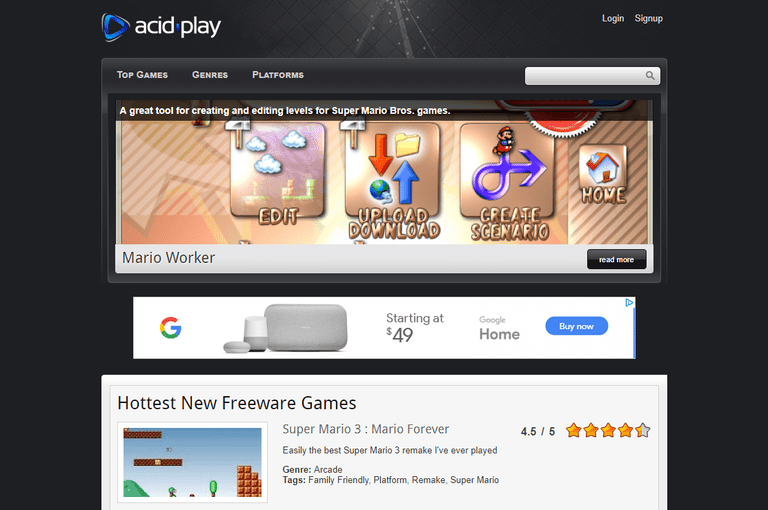 Acid Play has grown into one of the more reliable free gaming websites around. It offers more than 860 free game downloads. The site's homepage lists the 10 latest games that have been added to the site along with a one-sentence description, genre, and size information. All games listed on AcidPlay.com are reviewed and given a percentage rating. The reviews and ratings are a great guide for determining the quality of the free game. The games listed on Acid-Play include a fair amount of console-style arcade games such as Super Mario and Sonic games but they do offer a wide variety of action, simulation and role-playing games. The advertisements are not overdone and there are no annoying popups from AcidPlay.com. In 2008, Acid-Play has gone through a redesign which has improved overall quality and navigation of the site. Acid-Play is easily one of the best sites to find freeware computer games. Searching for games on Acid-Play is quite easy. Users can search by title in the Google search or browse by Top Rated, Most Popular, or by Game Genre. One thing about searching by Genre, the games are not listed in any particular order. It's definitely not alphabetical but could possibly be listed by most popular. Once you've found the game you're searching for the individual game pages provide the download links. Download speeds on Acid-Play are excellent, there are still a few games not hosted on the site but this seems to be a minority. Broken links are not a problem on Acid-Play as the site is continually updated on a regular basis. The placement of advertisements is not overdone either, while there are ads surrounding the download links, it is fairly clear where the actual file download links are located versus ads. While the site is still online and all games are accessible it appears that as of late (2015) that the updates to the site have become more and more sparse. The popular free games on the site are still all present and available but no new games have been added in over a year. Popular games hosted on Acid-Play include Mario Forever, Icy Tower, Little Fighter 2 and Soldat to name just a handful. There are not many websites comparable to Acid Play anymore in terms of hosting and making it easy to download free PC games. With the growth of free to play games many of the older freeware titles have become less and less popular.